Metadata delivery to Gracenote, TiVo, MediaNet, Audible Magic, Exactuals - RAI, Crunch Digital, ACRCloud, AcoustID, and Quantone via a redesigned Registrations module that greatly improves user experience. Ability to input sub-publishing information for multiple territories. Expanded U.S. Song Registrations so rights-holders can deliver directly to the Harry Fox Agency, Music Reports, and Loudr for mechanical licensing. TuneRegistry has also scaled its offering to support larger catalogs through its new Enterprise Plan, with universal content distribution and rights management platform Vydia, streaming-first music distribution platform Repost Network, and record label/publisher Made in Memphis Entertainment as its first customers. The new plan gives users exclusive access to a database that carries up to 100,000 songs, unlimited recordings and releases, sub-catalogs that enable colleagues/clients to manage their own databases, bulk import/export, and year-round priority support. In addition, the plan allows unlimited users to access a catalog, a feature necessary for record labels, music publishers, and artist management companies to properly navigate and administer their rights. For more information on TuneRegistry or to sign up for the service, visit www.tuneregistry.com. TuneRegistry is a music rights administration platform that saves rights-holders time and money by simplifying and streamlining music registrations and metadata delivery. Users only need to set up their catalog once before delivering songs, recordings, and releases to TuneRegistry’s growing network of partners, which includes Acoustid, ACRCloud, ASCAP, Audible Magic, BMI, Crunch Digital, Gracenote, the Harry Fox Agency (HFA), Loudr, Exactuals – RAI, Mediabase, MediaNet, Music Reports, Nielsen, Quantone, Radiowave, SESAC, SoundExchange, and TiVo. 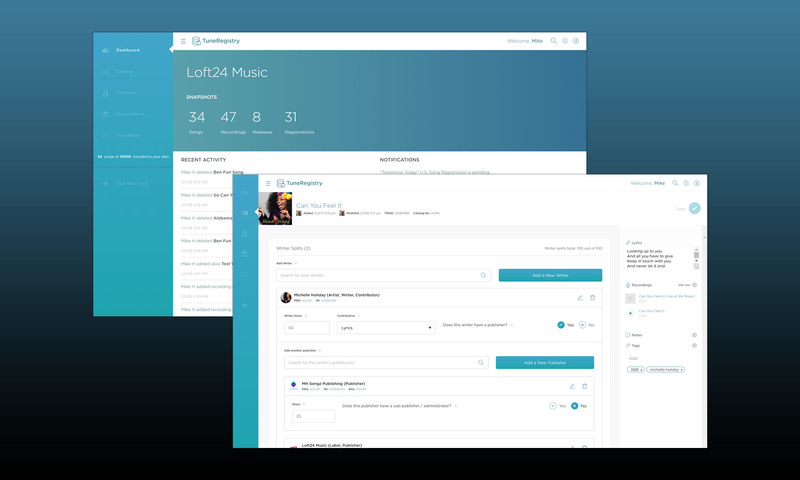 Founded in 2015 and first launched at SXSW 2017, TuneRegistry is an independent, privately held company that does not act as a publisher nor label, allowing users to retain 100% of their rights and royalties. For more information, visit www.tuneregistry.com.